//Edit: This has now been fixed! Scroll down to read the solution. 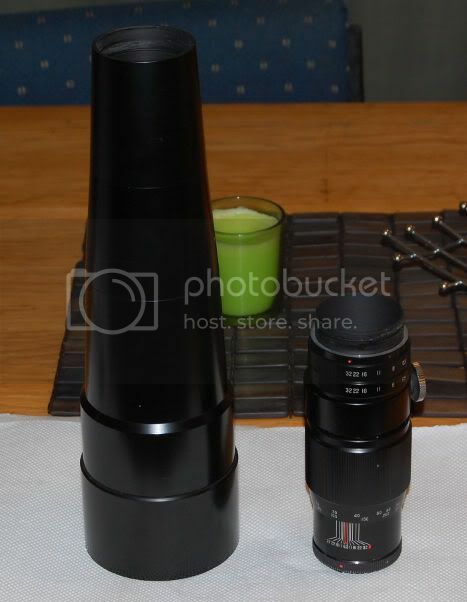 I just received my newest toy, a 500mm Vivitar f/6.3 preset telephoto lens. However, it appears to have a very stiff aperture ring, to the point where apertures larger than f/11 cannot be set, and I am hesitant to adjust it too much in the f/11-f/32 range for fear of damaging it. It doesn't make any noises, and all 18 of the blades look clean and without any bends, kinks, or evidence of scraping against each other. Has anyone taken one of these apart, and/or have any suggestions on how to fix this? I read a lot on here about how it is desirable to not have oil on the aperture blades... but if the mechanism needs lubrication, what type of oil do you use? Is there any grinding or is it just resistance you feel?I had a pancolor that has gotton easier to use with use....maybe the same with this? No grinding that I can feel... it's just very very tight. I've moved it back and forth a few times, and it doesn't feel like it has freed up any. //edit: In fact, moving it back and forth appears to have made it tighter. It seems to be the most tight when trying to open up the aperture, and is slightly looser when trying to stop it down. So now my question... 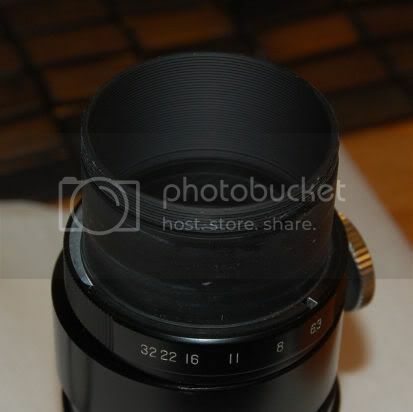 I figured out how to partially disassemble the lens, as it will actually unscrew into two halves right in the middle. I can then reach one side of the aperture mechanism through about 4" of tube. 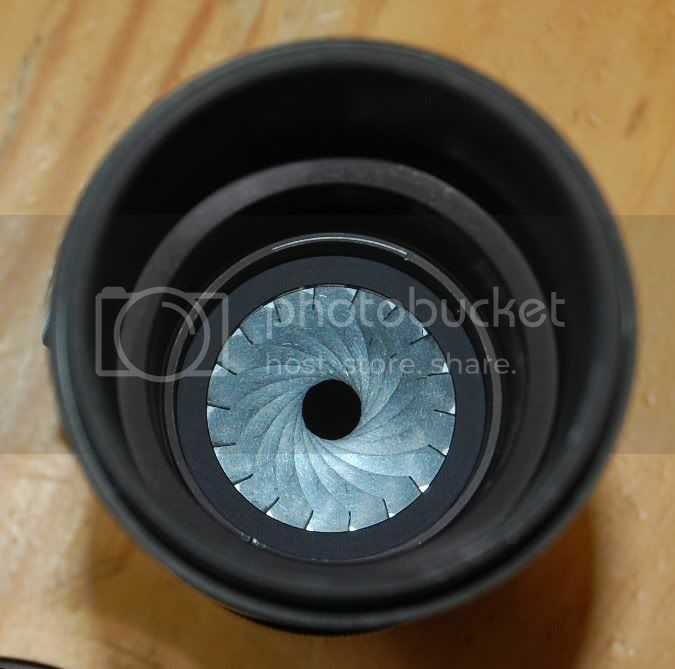 Is it safe to put a small amount of the lighter fluid around the outer edge of the aperture blades, with the mechanism still mounted in the lens? It isn't the thorough cleaning that it probably needs, but would this be enough to tell me if the problem is a crudded up mechanism or a more serious mechanical issue? A minor update... I dabbed enough lighter fluid onto the blades to get them good and soaked, and then worked the mechanism back and forth a bit. It seemed to loosen it up, but only in the f32 to f11 range. At f11 it still sticks just as much as before. So I suppose now I need to figure out how to take it apart... There are a handful of tiny tiny screws in odd places, anyone have any suggestions on how to figure out which one is which? Hi Scheimpflug, I don't remember ever working on one of these so can only offer a couple of hints. Blades themselves need to be dry, NO lubricant of any kind. Solvents used anywhere nearby can cause migration of lubricant to the blades so should be avoided if possible. Sometimes it's the blades which jam, sometimes it's the control mechanism. 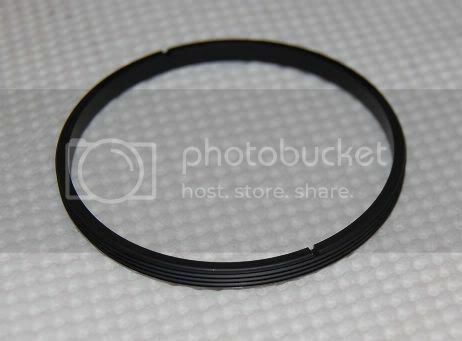 Build-up of grease from hands can jam the aperture ring itself, click-stop BB can come adrift, its spring can then jam the ring. Even with variable stop-spacing there may be cams which wear or jam, return springs can be unmounted, locking grub-screws can loosen & allow a housing to rotate out of sync. The point of all this is that there is no substitute for dismantling and cleaning or repair unless you're very, very lucky. be careful! Blades are safer retracted. Work slowly & methodically, make notes & sketches. With something unfamiliar I look for screws appearing to be a "set" - often of 3 - and loosen them slightly, then feel for movement in the part I think they hold. When the construction isn't obvious I spend much more time looking & thinking than unscrewing. If removing a screw doesn't reveal its purpose I replace it & try another. Eventually things become clear. This is true for lenses which have an automatic aperture. Many of the Russian preset lenses, and some German lenses, were designed to have, and manufactured with, oil on the blades. Not everyone believes this. Maybe your lens is similar to the one described in the link. Whilst it's true that preset lenses don't require speed of movement from their diaphragm blades it's also true that the viscosity of lubricants changes over time. With 18 blades each blade is relatively narrow and easily distorted. Many preset mechanisms transfer a high proportion of any force applied to the aperture ring almost directly to the drive ring. One lens arrived in my workshop with every single blade destroyed. The owner had tried increasing force in an effort to free blades which had only needed cleaning. I haven't ever found blades that actually needed lubricant but I have found many that were seized by it - so it's always been my policy to remove all traces of oil from blades. I'll use a tiny smear of grease on a pivot, cam, clickstop etc. only if I'm sure it can't migrate to the blades. "locking grub-screws can loosen & allow a housing to rotate out of sync." Does the indicated aperture setting seem to agree with the actual aperture? If not this may be the problem. In some lenses the diaphragm housing is prevented from rotating only by 3 grub-screws, tightened after assembly & calibration. If the housing is displaced the drive ring's range of movement will be limited. Thank you unclemack and sichko! Lots of helpful information, and the mechanism on that website definitely looks like mine. * The aperture ring and preset ring both move relatively freely in the 32 through 16 range, only binding up at 11, so I would assume that this means that the ring itself isn't crudded up from hand gunk. 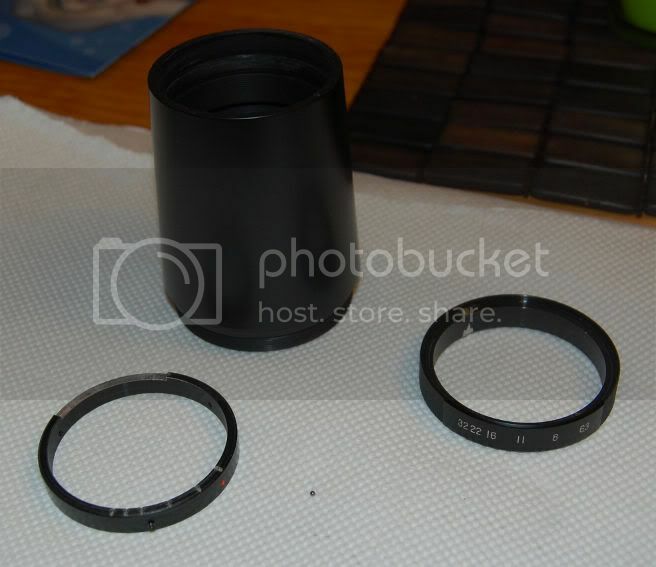 * The aperture ring does make nice clicks for 32, 22, and 16, so I think the spring and tiny BB are OK.
* I hadn't considered that the housing could be rotated... but the aperture looks pretty small at 32, so I think it is at least close... I will check into this further though. * I did find one crack in the aluminum hood, so it could have been dropped at one point. 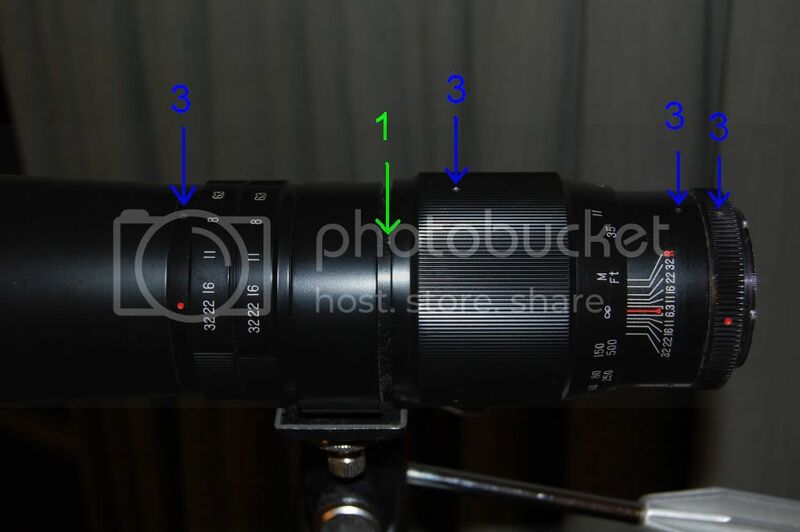 The blue arrows show the locations where there are three screws, evenly spaced around the lens barrel. The place where there is a green arrow, there is only one screw. Do you have any guesses as to which screws I should try first? Should I just start closest to the aperture, and work my way down? I would go the easy end first and start from the right of picture at the 3 screws from the mount. The 2nd set of three might be like the Astronar lens I had and be the screws that hold the mount in place? Uncle macks Idea of removing one screw at a time sounds good to get a feel for the lens. 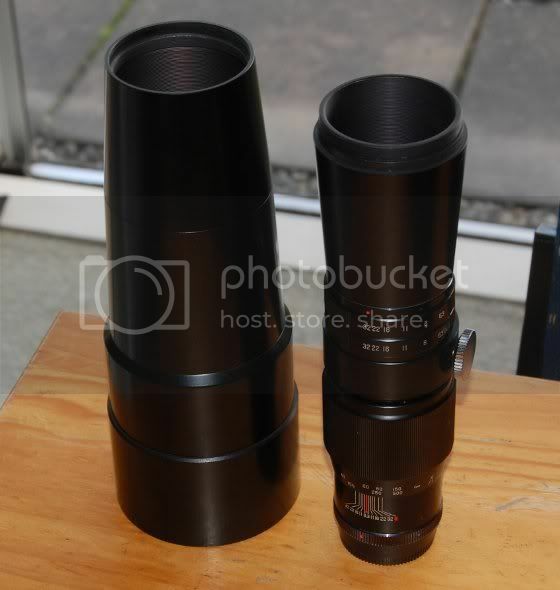 Because of the size of the lens it's unlikely the far-left group of 3 screws holds the main body of the lens together. The locking ring with the (attempted?) disassembly mark probably does - I would expect to find similar locking rings (or threaded connections like the one you've unscrewed, or flanges) on all main body sections of such a long lens because of the leverage involved. Lacquer is often used to secure these locking rings and threaded sections but occasionally you do find the threads locked with a grub-screw. Bad practice but it happens - if you unscrewed one without first removing the grub-screw the thread would be destroyed. 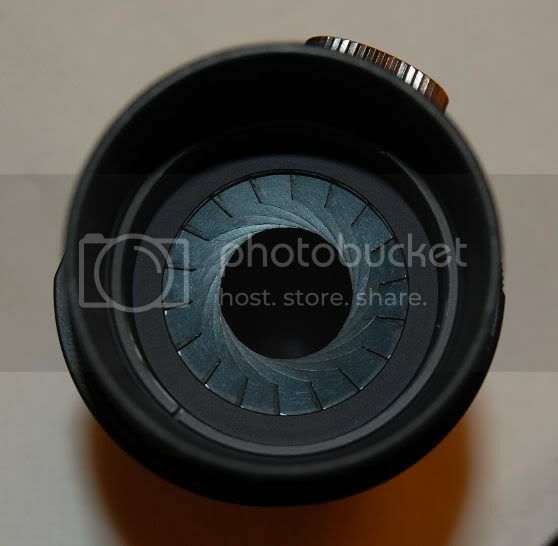 For a deep-set locking ring normal lens keys can twist too much. A length of 1/8" flat steel bar of the right width, 2 corners ground or filed to fit the slots works. Or steel tube of the right diameter ground to fit - whatever's handy! Focus ring screws probably adjust inf. setting. Single screw may be the focus stop - or may lock a large threaded section as above. 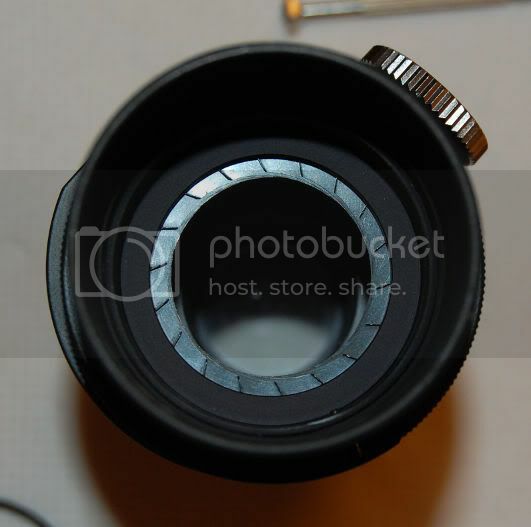 Screws in outer mounting ring probably set rotational orientation of the lens but removal of ring may access main body fixings. Screws in DoF scale may allow access to main body fixings, removal of which may let you see the rear of the diaphragm assembly. Without the thing in hand these are just guesses, please bear that in mind. Update: The lens is fixed! It turns out that the next barrel section did just unscrew like the others, as unclemack had suggested. This one was definitely tighter, so I suspect it might have had a drop of glue or thread lock compound on it. After removing that barrel section, I loosened the three tiny screws around the next ring, which turned out to be the ring with the detents which holds the aperture control rings on, so one of the two aperture rings simply fell off once this was removed. The little tiny ball bearing also fell out, but it didn't make it very far. I always use quilted paper towels over my work surface to help keep things clean and somewhat padded, but the quilted paper towels also do a great job of keeping runaway screws and these BBs from rolling away. Ok, so now that the next barrel section was off, the diaphragm blades and the mechanism were much more accessible. I started poking at the lock ring on the inside, and found that it was only finger tight! I unscrewed it and removed it from the lens. ... and to my surprise, the aperture opened up! It turned out that this lock ring was simply installed too tightly, and was making it hard to turn the mechanism! All I had to do to fix the problem was to put it back in, and not tighten it down all the way! I am still a bit mystified however as to how it stays in. It really isn't tight at all, barely finger tight. Since the aperture mechanism rotates against it, I suspect that with further use, it will either come loose and fall forward into the lens, or tighten back up again... This ring appears to have no structural purpose, other than to hold the aperture mechanism in place. ... and now, we have an assembled & working lens. Thanks again to everyone for the help & suggestions.